There is a unique flavor to the relationship that children share with their grandparents and a very special one in its own sense, nothing compared to any other thing in the world. 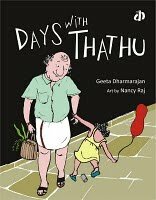 Through 'Days with Thathu' , a little girl brings to us a glimpse of her beautiful small world which she shares with her grandfather and all the ordinary things that they do extra-ordinarily, in fact, the ordinary things become extra-ordinary when they both do it together. She enjoys being with her Thatha, who is lovingly called Thathu sometimes. They go to watch cinema, go in the open sea playing with the fish, Thathu walks and she skips holding hands, they enjoy grey clouds and playing in the rain, they run together, they somersault together and play pretend games while she sits on the lap of her dear Thathu. She enjoys all the activities that she gets to do with her Thathu during the day and then a peaceful rest on his lap. A sweet little book conveying the true feelings of a little heart and the same are beautifully projected by the art work of Nancy Raj. She has brilliantly captured the togetherness and loving bond between a grandfather and a granddaughter through sketches, using very little colors which works marvelously to bring out the simplicity and the clarity. Sounds like a heart warming tale!! Lovely. Was reminded of my own grandmother, whom I was very close to. As also the book 'Ajoba' by Tulika. Will keep this one in mind. Thanks Vibs. Nice pick Vibs! My kids will relate to it big time.